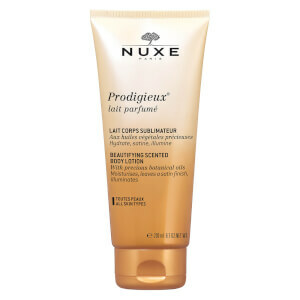 Treat your skin while you sleep with the NUXE Creme Prodigieuse Boost-Night Recovery Oil Balm, an ultra-nourishing night-time treatment that works to brighten and smoothen the look of skin come morning. With a nurturing and cocooning texture, the oil balm combines Macadamia Oil with a Jasmine Flower antioxidant complex and Nopal Flower Extract (the flower of the Prickly Pear) to encourage the self-generation of skin overnight. Skin looks brighter and energised, and features appear smoother. Apply at night to the face, neck and décolleté. Aqua/Water, Dicaprylyl Ether, Alcohol Denat., Glycerin, Squalane, Dimethicone, Macadamia Integrifolia Seed Oil, Hydroxyethyl Acrylate/Sodium Acryloyldimethyl Taurate Copolymer, Octyldodecanol, Parfum/Fragrance, Phenoxyethanol, Tocopherol, Ethylhexylglycerin, Acrylates/C10-30 Alkyl Acrylate Crosspolymer, Ribose, Sodium Gluconate, Opuntia Coccinellifera Flower Extract, Butylene Glycol, Sodium Stearoyl Glutamate, Xanthan Gum, Polysorbate 60, Sorbitan Isostearate, Pentylene Glycol, Jasminum Officinale (Jasmine) Flower Extract, Faex Extract/Yeast Extract, Sodium Hydroxide, Biosaccharide Gum-1, Mica, Ci 77491/Iron Oxides, Calendula Officinalis Flower Extract, Benzyl Salicylate, Linalool, Citronellol, Alpha-Isomethyl Ionone, Geraniol [N3902/A].